Little has changed on the ground since this snapshot was taken April 10. The days are ticking away, and still there’s no construction at the site of Lowe’s planned Albany home improvement center at Ninth and Oak, a development that’s supposed to be open for business by New Year’s Eve. As of Tuesday a building permit had not yet been issued, and the latest hangup has to do with an access along the Periwinkle Creek side of the site. City Manager Wes Hare said Tuesday the original plan was to have Lowe’s grant the city an access easement — presumably for maintenance of the channelized creek bed — but the company instead wanted to deed the strip of land to the city, and the deeding process was taking longer than granting an easement. 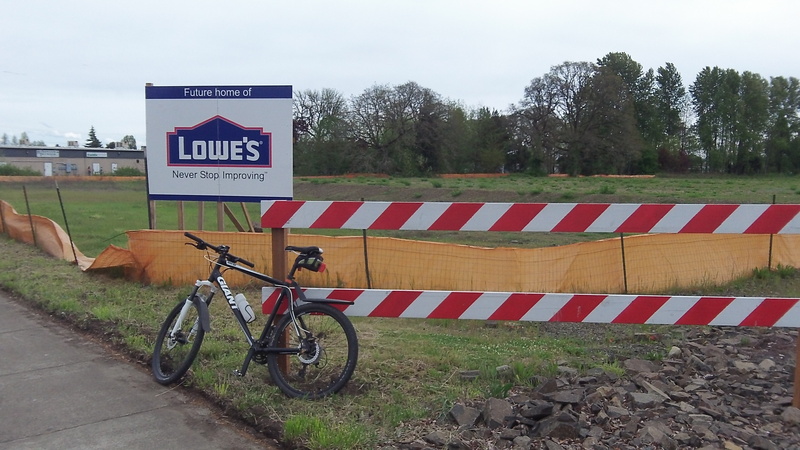 On April 11 I had asked what was taking so long, considering that Lowe’s had applied for a building permit on Feb. 11. In response, City Engineer Jeff Blair and Building Official Gary Stutzman prepared an account and timeline of the plan review. I got their statement on April 15. They said Lowe’s “structural package” was not ready for review until Feb 26, and the first review of the plans by all departments was finished on March 17. The city asked for corrections and received revised drawings on April 2, and all departments finished their review by April 10. “Two structual issues remained to be resolved, and Planning had not signed off as they are waiting on a recorded access easement,” Blair and Stutzman wrote. They pointed out that the plans included 145 big full-scale drawings and 1,067 pages of documentation, and that it took Lowe’s 14 days to respond to the first list of corrections. Taking account of weekends when City Hall is closed, they said that left only 23 days to work on the plans’ review. At the time of their writing last week, two permit applications, for fire sprinklers and alarms, remained outstanding. IF I’m reading this right, it seems like the city is a bigger hang up than Lowes? Too much delay and Lowes just might pull the plug and win?